The online platform that measures & increases health, well-being and productivity in the workplace. Just fill out the form below and we will get in touch shortly with a detailed estimate. And centralizes everything you need in one user-friendly place. Offer the same level of well-being, support and options to every member of your teams, wherever and whenever they work. Sales reps and agencies included. From healthy food to coaches to therapists to classes, talks, and workshops. Get connected to the best wellness professionals only and get the best results. Speed to data allows you to make powerful data-driven decisions. Gain insurance, time and efficiency by accessing your teams’ well-being levels in just a few clicks. Tap into collective intelligence. Don’t waste any more time and money in things and events your people don’t want. Instead, create your corporate culture together and support engagement. Well-being is not only about risks assessments, engagement at work or physical activity. Human beings are complex and all different. That’s why Wellnest addresses well-being on all levels possible. Make sure to run an agile company by spotting risks and problems on time and addressing them quickly. The only way to be on top of your game. Insight without action is much worse than having no insights at all. This is why you can choose from unlimited solution options, for each of your wellness pillars, may they be paid or free solutions. AI helps you give your employees a smart tool to help them improve according to their own personal needs, levels and interests. No extra emails with info they don’t need or don’t want. Your companies’ results directly depend on your employees’ well-being. Thus, if you want to achieve sustainable success, you must support your employees’ health & well-being. But where should you start? Researches show that a company can generate a 7% drop in health care costs and 62 minutes of additional productivity per week per employee by increasing, optimizing, and measuring wellness levels. Not to mention the positive impact on your work environment, turnover, absenteeism and… on your bottom line! We all want to be healthy, happy, positive and productive. This is why Wellnest makes sure you give your people exactly what they need to be at their best and do their best work. Wellnest is the only intelligent corporate wellness optimization platform that listens to your employees in order to manage and automate your strategies. The only way to be sure to leverage your assets, increase health, wealth and well-being in the workplace to get the best results possible. Audit and assess your company’s wellness levels based on Wellnest’s different pillars. This is a specific approach, backed by science, that will easily pinpoint your strengths and weaknesses when it comes to health, engagement and well-being in the workplace. Choose your corporate wellness strategy, based on Wellnest’s recommendations. Plan and implement solutions tailored to your employee’s real needs. 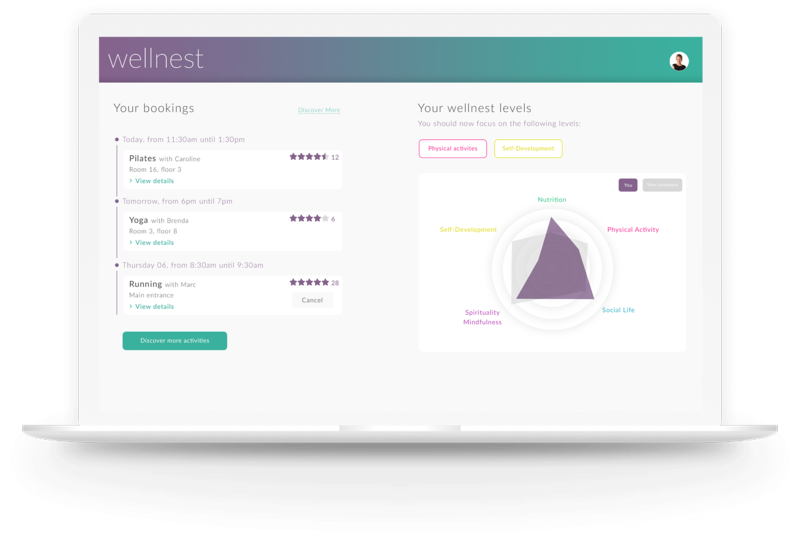 Wellnest also connects you with the best wellness professionals based on your specific needs and requirements to get optimal results. Track your results and improvments via your Wellnest dashboard. See how your company’s wellness levels evolve and improve. Collect feedback from employees and automate your internal communication. Adapt your strategy and tweak the solutions according to your results. Do you have any specific interests or projects? We have a non-spam policy. Your data won’t be communicated to any third party. Wellnest uses the information you provide to us to contact you about our relevant content, products, and services. You may unsubscribe from these communications at any time.